Iolo is probably best known for their System Mechanic line of utilities (millions of users). However, the company, based in Los Angeles, also produces security software. Iolo System Shield provides real time protection against viruses and spyware. While the program may appear to be a basic antivirus from the interface, there are actually a lot of nice features. They include an Auto Scan capability that can be tweaked with a variety of settings and a heuristic email scanner. Also one should expect an overall low resource usage feel and System Shield is also certified by Westcoast, ICSA, and vb100 labs, so expect excellent detection rates. 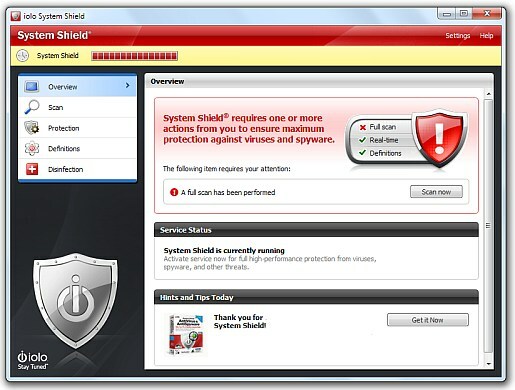 The installation of System Shield was fast and what other free antivirus should envy. The installer is an initial downloader that downloads a 52 megabyte setup file. The installation literally finished in about 10 seconds. The installer detected Element Antivirus as conflicting even though I had already uninstalled it weeks ago. Unfortunately, there is a restart required. I was then prompted with a message stating that the installer didnâ€™t complete properly (nice that this type of detection is built-in). However, I simply exited this dialog box and started System Shield. The program then performed an automatic update. Virus Scanning with Iolo System Shield is easy. Unfortunately, there is only one option for scanning which is the full system (one can scan a specific file or folder but its only one at a time). However, virus scanning is really quite fast. In fact, System Shield scans at a consistent 7 to 11 (peaking at 15!) megabytes per second which makes it one of the fastest antivirus engines tested yet. Even though scanning is way above average, concurrent system tasks are not affected. The program didnâ€™t detect any viruses or spyware on the test system. However, Iolo claims that System Shield can detect over 2 million viruses and the update frequency is set to every 3 hours (can be changed to 1 hour) indicating that there is a very active antivirus support lab. Iolo System Shieldâ€™s resource usage is reasonable. During scanning the program starts a new process that uses anywhere from 100 to 150 megabytes. CPU usage is low ranging from 3 to 9 % and the program exhibits good multicore efficiency. While idle the program uses approximately 22 megabytes of RAM. 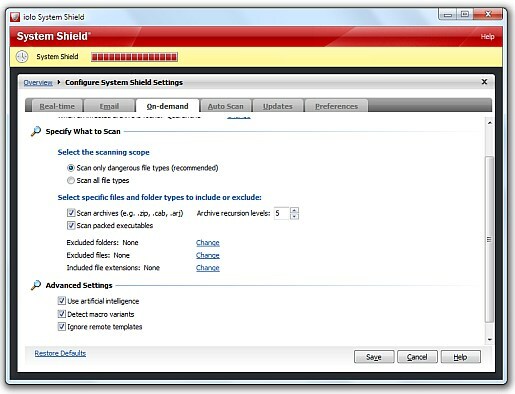 In addition, to very fast and accurate scanning, Iolo System Shield offers a lot of customizable features that donâ€™t clutter the interface. The feature that intrigued me the most was the Auto Scan option. The scanner can be set to scan depending on how long one is away from the computer, if one is not on battery power, if CPU usage is below a user defined percentage, and if the computer is not in the full screen mode; essentially a customizable game mode. With on demand scanning there is the option to set archive recursion levels scanning (archives packed within other archives, havenâ€™t seen this in other free antivirus) , artificial intelligence (heuristics but not enabled by default), detect macro variants (viruses that have pieces of other viruses code), and finally ignore remote templates (prevent iframes or activex from accessing local system resources?). The mail scanner also supports a wide range of email clients like Thunderbird, Outlook, The Bat, Netscape, Eudora, and about 15 others. One can add an unsupported mail client very easily. 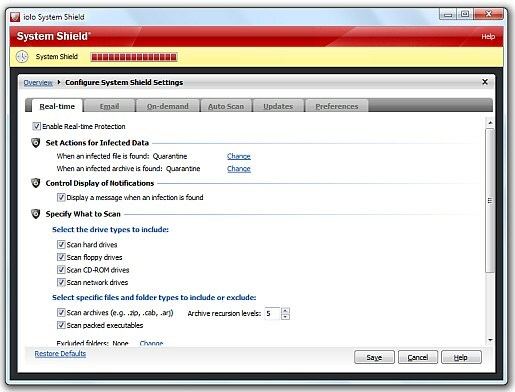 All in all Iolo System Shield provides excellent protection when compared with most free antivirus. Itâ€™s ashamed that it isnâ€™t featured more online.